Styled Shoots—What, Why & How? Today we wanted to shed some light on one of our most favorite parts of this industry, styled shoots. Styled shoots are a great way to get marketing materials for a myriad of different vendors. They are normally put together by coordinators, photographers, or venues to showcase their skills and/or products. 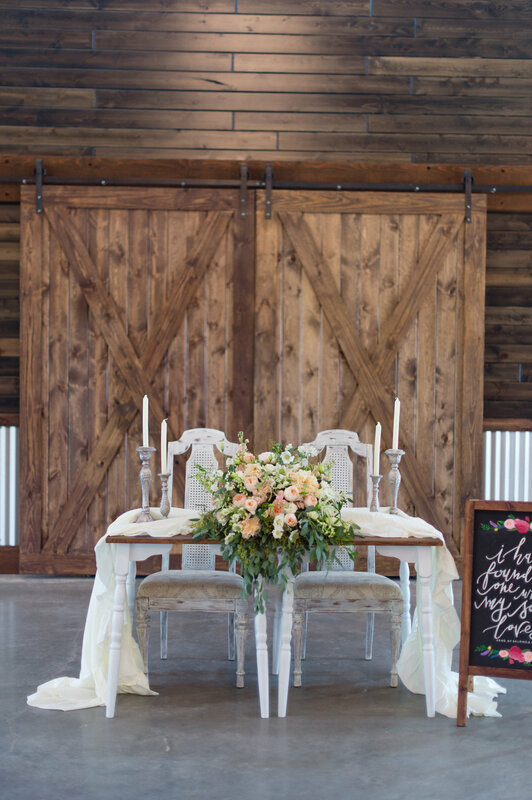 We have had florists, vintage furniture rentals, makeup artists, hair stylists and more come out to Peach Creek Ranch along with some of our favorite photographers to capture the day! You can style brides, grooms, bridesmaids, or models to fill any of the roles. Sometimes these shoots even mimic real weddings, elopements, or bridal showers to make them seem more relatable to those viewing the images. It also works as great inspiration for brides-to-be looking to kick up their wedding style a notch. These images can be used as great marketing tools for a business! It is a very low maintenance way to produce new material for websites and social media platforms. They are so low cost because you are using your own materials and everyone on the styled shoot usually donates their services for the day to be able to use the photos to their advantage. With multiple vendors coming together, vendors get some really great images at a very low cost to them. They also don’t require a lot of time! Just give each other an afternoon of your time and get back priceless images. Even better, they are images that these vendors tailored to their exact liking, and therefore they are not wasting precious time and money on a shoot they do not prefer. One of the other huge reasons to do a shoot such as this is to also attempt to get published on a wedding blog or publication, which can do wonders for your image! If you are a vendor and are interested in doing a styled shoot, we would love to have you out to Peach Creek Ranch! Step one would be to partner with multiple different vendors to set up the shoot that you have in mind. Choose what you would like the models to wear, what kind of florals will match best the venue and the subjects, and what type of lovely details you would like to incorporate. These all need to complement each other to make the most of the shoot for everyone involved. Once you iron out those details the rest is just a wonderful creative session that can be a complete blast to be a part of. Then, you can contact us and set up a time that works for everyone and communicate with us the style you’re going for, and we would be happy to make it all work! Stay tuned for our next post. We will be updating you with our latest boho inspired styled shoot. We are sooo excited about this one!